Tutors discuss why the River Nile was so important! In History our home-schooled students have been looking at the River Nile and why it was essential for survival to ancient Egyptians. The children have learnt that in ancient times the people of ancient Egypt depended on the Nile to survive. The River Nile runs through Egypt and most people live along and around it today. This was also the case in ancient times as this is because the land near the Nile is a place where crops can be grown, and the rest of Egypt is desert. 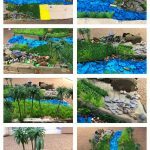 To aid the children in understanding the above they helped create a model of the River Nile.